No, I didn’t make up the whistleblower title for Registered Geologist Robert (Bob) H. Gilkeson. For his important work on groundwater contamination at the Los Alamos National Laboratory, in 2007 he received the annual “Whistleblower Award” from the Alliance for Nuclear Accountability at a Washington, D.C. reception. The Los Alamos National Laboratory (LANL) in New Mexico is operated by competent people, right? And, is filled with respected scientists who always tell the truth, right? That is the “official story”—the world’s greatest science protecting America—that LANL has been feeding to the American lawmakers, media and the public for nearly seven decades. But now the northern New Mexico community members and organizations are determined to put an end to LANL’s “official story.” They’re building a “new story.” Here is their story. On Wednesday July 6, LANL opened after being closed for more than a week due to the Las Conchas Fire that has become the largest fire in New Mexico history. As of July 16 it has burned 156,245 acres including large areas in crucial watersheds and sacred sites in the Santa Clara and Cochiti pueblo lands. That Wednesday afternoon I sat down for 3 1/2 hours of conversation with Bob Gilkeson, Joni Arends, Executive Director of Concerned Citizens for Nuclear Safety (CCNS), and David Bacon, board member of CCNS. I was shocked to learn about the massive amount of toxic and radioactive wastes that are on the surface and in subsurface pits at LANL. It got much worse—I learned about the great seismic hazard that has potentially catastrophic implications for the entire American southwest. LANL is also proposing to build a new $6 billion nuclear facility as part of an integral plutonium pit (triggers) production complex for building new nuclear weapons. You can stop this—it is your call. After graduating with a B.S. and M.S. from the University of Illinois Geology Department, Bob worked as a research scientist at the Illinois Geological Survey from 1973 to 1987. He then joined the environmental company Weston as Technical Director for Earth Sciences, first in their corporate office in Westchester, Pennsylvania and then to their Albuquerque, New Mexico office. In 1988 he joined LANL as a senior consultant. His work focused on characterizing contamination from the lab’s large waste disposal sites, which he says, “weren’t more than just dumps.” This was the first comprehensive study of contamination under the Resource Conservation and Recovery Act (RCRA). In 1997 Bob was asked to lead the big project of putting in a network of monitoring wells across the then 47 square mile facility to look at groundwater contamination from laboratory operations. After reviewing the work plan that was written by external contractors and some lab employees, he realized it was incorrect—most well locations needed to be changed and the mud rotary drilling method had to be replaced. Right now one of the great concerns is a 63 acre unlined dump, known as Area G. On the surface of Area G, there are an estimated 20,000 to 30,000 drums (each drum is 55 gallons) with plutonium–contaminated waste sitting three high inside fabric tents. If you think that is bad news, consider this. Underneath all those drums are enormous pits where LANL dumped waste starting in the late 50’s. Take a look at the Area G open pit photos here, and imagine it being filled with toxic and radioactive waste, and covered with soil. And also know that LANL has no detailed inventory of all that subsurface waste. Bob has watched the many mistakes on monitoring groundwater contamination from Area G and told us “The current monitoring well network at Area G is practically perfect for hiding detection of contamination from the buried waste.” As you can see Bob’s work on groundwater contamination is very crucial. Right now he is blowing the whistle on a potentially catastrophic issue—the great seismic hazard at LANL. Let us listen. He then told us how earthquakes operate in this network of faults. It could be an earthquake that just causes a rupture on the Pajarito Fault—a single rupture. A major earthquake that happened here was in 600 AD, and it was a single rupture. It could also be what’s called simultaneous rupture: a single powerful earthquake would cause rupture on two of the faults—Pajarito Fault and possibly the Rendija Canyon Fault. The still more powerful earthquake is when the shaking would cause the Pajarito Fault to rupture, and the energy from that would trigger a slightly delayed rupture on either the Rendija Canyon Fault or the Guaje Mountain Fault. “That’s synchronous rupture and the most dangerous,” Bob told us. Bob said the best interpretation of the seismic data is that two earlier earthquakes in the past 10,000 years at LANL were synchronous ruptures. He then showed us Figure 7.53 in the PSHA report that shows synchronous rupture being 75% more powerful than simultaneous. But in chapter 5, the report states that synchronous is consistently less powerful than simultaneous. “It’s a self–contradictory report. Synchronous is always more powerful. So the seismic hazard in the report which was used for the design of the proposed CMRR–NF is incorrect and grossly underestimates the hazard.” Bob explained. UK’s Daily Mail reported on March 16, 2011 that a top official from the International Atomic Energy Agency had warned the Japanese Government in December 2008 that the Fukushima nuclear plants would not be able to withstand a major earthquake. Did anyone listen to him? Bob told us, “The youthful Pajarito Fault System (PFS) is not a stable fault system that has been studied and the power is understood. The PFS is capable of great damage to LANL facilities at this time. LANL reports describe the PFS as growing and gaining linkages within and among different segments, and as that occurs, the size and power increases. The great power of the PFS for destructive earthquakes is not known and requires detailed field investigations.” Is anyone going to listen to Bob Gilkeson? Fukushima was producing nuclear power, whereas LANL produces nuclear weapons. There is a difference, but David made it clear for us, “Because they’re looking at a possible major earthquake, it’ll impact all of us. With 6 metric tones of plutonium inside the lab, and all of the surface and subsurface nuclear waste, it’ll impact the entire American southwest, everybody. They need to pack up right now and leave.” I was puzzled by David’s comment, even if they do pack up, where would they go? Which community on this earth would want an operation in their backyard that would put radioactive and hazardous toxins into their watersheds, air and lungs? There are seven basic parameters identified in the PSHA report. Bob explained each one in detail and showed us that LANL doesn’t have accurate knowledge of any of these seven parameters for the proposed CMRR–NF and other critical nuclear facilities across the 40 square mile LANL site. The PSHA report says that it follows the 1997 Nuclear Regulatory Commission Seismic Hazard Guidance Report (NRC Report). “No it doesn’t, and the way it doesn’t are many that are important,” Bob told us. Here are those seven parameters. In April, the Department of Energy (DOE) released a draft Supplemental Environmental Impact Statement (SEIS) for CMRR–NF that says they have accurate knowledge of the locations of faults at the CMRR–NF, and that the closest fault is 3,000 feet away to the west—the Rendija Canyon Fault. However Bob pointed out that the LANL seismic hazard geology team published a peer–reviewed paper in the journal Geosphere in 2009 that contradicts this view. “They say that the southward extent of the Guaje Mountain Fault is not known because it has not been mapped. And they have a concern that the southward extension is similar to the Rendija Canyon Fault, which means the Guaje Mountain Fault could come right down to the CMRR–NF. But, that is not what the SEIS document says,” Bob told us. 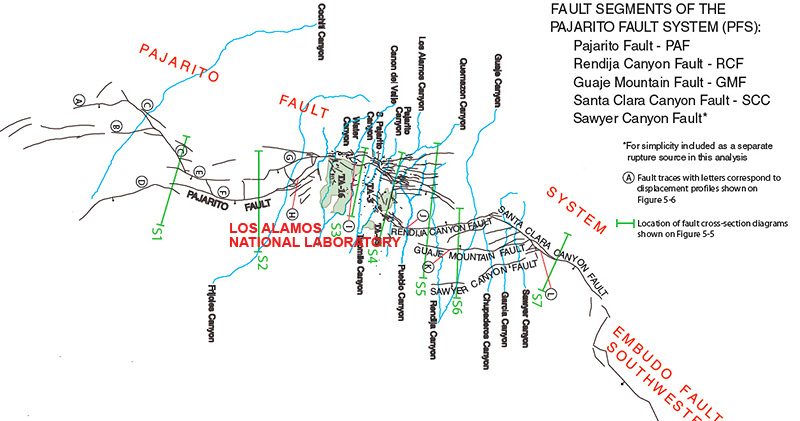 There is also disagreement among LANL scientists on how to map the presence of faults. The LANL seismic hazard geology team based the existence of faults on the mapping of displacements along the fault trace, but they didn’t look at zones of intense fractures to identify potential locations for buried active faults. However, the NRC Report describes the importance for knowledge of buried active faults. Bob pointed out that Dr. Kenneth Wohletz, a LANL scientist, had mapped zones of intense fracturing and inferred that there could be active faults located close to the proposed CMRR–NF (you can see the map here). Bob also called up seismic experts from around the country and they agreed that zones of intense fracturing could be evidence of active faults that are buried in the Bandelier Tuff. The Richter earthquake magnitude scale is a presentation of the seismic moment. Bob pointed out that the design of the proposed CMRR–NF was incorrectly based on a maximum moment of 7.27 for simultaneous ruptures and the same report describes synchronous ruptures as 75% more powerful. The NRC Report recommends the use of an analog site if there is great uncertainty in maximum moment. The PSHA report recognized the 7.5 magnitude 1959 Hebgen Lake Earthquake in Montana, near Yellowstone, as a good analog, but used the obviously incorrect 7.27 magnitude to calculate the hazard. The NRC Report also recommends adding 0.5 magnitude unit to the maximum moment, if there is any reason to believe that there is potential for an earthquake that would be more powerful into the future. The PFS is a youthful fault system that LANL reports describe as growing in power. “The minimum moment for the proposed CMRR–NF should be 8 (7.5 from the analog + 0.5), and not 7.27, as they’ve done. And 8 is about 23 times more powerful than 7.27,” Bob concluded. Kappa is the behavior of the rock strata to the earthquake shaking—it’s a local effect. And the knowledge of local shaking is obtained by having a network of reliable seismographs. Bob informed us that the LANL 1995 and 2007 PSHA reports used assumed values for the key parameter kappa because the data from the LANL seismograph network was not usable to calculate kappa because they were not properly calibrated and maintained. The plan was to drill two deep core holes down through the complete thickness of the dacite (approximately 1,000 feet) at the proposed CMRR–NF location. They ended up drilling only one, and only down to 43 feet into the dacite. They discovered that the dacite rock was busted up and fractured and wasn’t a dense competent layer. They made an assumption that at a greater depth it was going to become a competent solid unit and they took what is a typical shear velocity of a competent intact layer of dacite. “It is very important to know the thickness and shear velocity of the dacite. Is it several hundred feet thick? And is it busted up all the way through its entire depth because of seismic activity? The fact that this dacite rock was so busted up is also possible evidence of active faulting below the proposed CMRR–NF. It’s another example they’re using assumed values,” Bob explained. I asked him how a nuclear weapons facility that is filled with plutonium can get away with so many assumptions for crucial seismic hazard analysis. After all, calculations for an accurate assessment of seismic hazard requires detailed field studies to gather knowledge for appropriate analysis. In August 2010 the Los Alamos Study Group filed a lawsuit in the U.S. District Court for New Mexico against the Department of Energy (DOE) and the National Nuclear Security Administration that claimed, “The Obama Administration had not written an applicable environmental impact statement (EIS) for the project (CMRR–NF), the cost, material requirements, and impacts of which have all grown considerably since the project was first conceived.” The Study Group wanted the government to write a new and thorough EIS, not a supplemental EIS. On May 23, 2011 Judge Judith Herrera dismissed the lawsuit after holding two days of hearings, but without allowing discovery, and saying that DOE had promised to complete a supplemental Environmental Impact Statement (SEIS). The DOE released the draft SEIS a month earlier that dismisses all alternatives to the project, and as Bob explained is completely bogus with regard to their seismic hazard analysis. On July 1, 2011 the Study Group filed a Notice of Appeal to the U.S. Tenth Circuit Court of Appeals in Denver. The lingering question in my mind was who would make the biggest bucks if the federal government hands out the $6 billion for the proposed CMRR–NF project. I was shocked to find out it’d be none other than Bechtel, the lead operator of LANL. They have the distinction of being the largest engineering construction company in the world, but what else do we know about Bechtel? The Reverend Holly Beaumont, a member of Las Mujeres Hablan, in her testimonies for the CMRR–NF SEIS hearings during the week of May 23, 2011 said, “Bechtel was investigated by the Nuclear Regulatory Commission (NRC) [following the Three Mile Island accident], who found that Bechtel ‘improperly classified’ modifications to the plant as ‘not important to safety’ in order to avoid safety controls. In 1985, the NRC fined Bechtel for harassing and intimidating workers who complained about these lapses.” That was the beginning of a long list of Bechtel’s distinguished accomplishments that Reverend Beaumont pointed out in her testimonies. Maps and Photographs Albums: An album of 3 maps of the Pajarito Fault System can be seen here, and an album of 8 Area G photographs can be seen here. These albums were specifically prepared to accompany this piece. Note for readers: I’m grateful to Robert Gilkeson for sharing his story with me, to Joni Arends and David Bacon for their generous assistance with this piece, and to Lorene Mills of Report from Santa Fe for her generous research help with my ongoing fire–nuclear series. AlterNet | Common Dreams | Counter Currents | Grassroots Press | League of India | Press TV | Progressive Radio Network | Sanctuary Asia | Truthout | Vijayvaani | and YubaNet. Following the article Bob Gilkeson was interviewed by Press TV that you can listen here, and Bob Gilkeson and Joni Arends were interviewed by Uprising KPFK–FM Radio in Los Angeles that you can listen here. Subhankar Banerjee is founder of ClimateStoryTellers.org. He is currently editing an anthology titled, Arctic Voices: Resistance at the Tipping Point (New York: Seven Stories Press, April 2012) and his photographs can be seen now in exhibitions Where I Live I Hope To Know at the Amon Carter Museum of American Art in Fort Worth through August 28, 2011 and in Earth Now: American Photographers and the Environment at the New Mexico Museum of Art in Santa Fe through October 9, 2011. He has been appointed Director’s Visitor at the Institute for Advanced Study at Princeton and a Fellow at Forbes College of Princeton University for fall term 2011.